RACHEL YOUNG PHOTO | South Jamesport resident Larry Simms stating his concerns with a request to side-step the town’s dark skies laws at Thursday’s ZBA meeting. Facing stiff opposition from neighbors and Riverhead civic leaders, the developers behind the Shops at Riverhead project now being built on Route 58 have withdrawn their request to build lights that are taller and brighter than what’s allowed under town code. “I know there are many people here tonight to discuss the issue,” Peter Danowski, an attorney for the developers, explained at the start of Thursday night’s Zoning Board of Appeals meeting, which drew dozens of residents from neighboring communities already incensed with the future shopping center’s land being clear-cut of all its trees and vegetation. “We will withdraw the application seeking the height variance with regard to poles,” Mr. Danowski said. The developers were seeking variances from the town’s dark skies code, which would have allowed lights in the shopping center parking lot that were 25 feet high instead of the permitted 16 feet. Mr. Danowski explained to ZBA members in July that higher lights would mean fewer light poles would be needed, from 165 to 61. News of the withdrawn variance elicited a round of applause from neighbors and vocal civic leaders. But some took to the podium in Town Hall to say they were still concerned about the company’s ongoing request to install lighting fixtures exceeding allowed illumination levels under a canopy at a gas station planned for outside the Costco Wholesale anchor store. Jennifer Hartnagel, a senior environmental advocate at Group for the East End, said the company failed to make an argument for any potential hardship that would justify granting the variance. Dark skies advocates here and elsewhere in the U.S. and Long Island have worked to support educational and legislative efforts to eliminate light pollution. The ZBA adjourned the gas pumps request until its Sept. 12 meeting. TIM GANNON FILE PHOTO | The site of the Knightland shopping center at the corner of Sound Avenue and Route 25A. Village Beverage has since moved. The Riverhead Town Board appears ready to grant an excavation permit that will pave the way for the construction of Knightland, the controversial retail center planned for the intersection of Route 25A and Sound Avenue in Wading River. Board members discussed the plan briefly at last Thursday’s work session and informally agreed to issue the permit at the upcoming Town Board meeting — despite the fact that there is still an active lawsuit challenging Knightland’s site plan approvals. That suit is currently in the appellate division of the courts, after the Riverhead Neighborhood Preservation Coalition, which challenged the town’s initial approvals, appealed a state Supreme Court ruling dismissing their original case, according to town attorney Bob Kozakiewicz. The courts have not issued any orders preventing the development from moving forward while the case is being appealed, and have rejected a request to issue one, he said. “The risk, if there is any, is on [Knightland principal] Kenney Barra,” said Riverhead Supervisor Sean Walter. “The litigants had applied for a temporary restraining order and were denied, so there is no prohibition against us issuing the permit, and the developer could actually go to court and force us to issue the permit. Peter Danowski, the attorney for Mr. Barra who’s been asking the town since March to issue an excavation permit for the project, said he didn’t think it was risky to proceed with the development while the appeal is still pending. “It’s risky to invest in projects in an economy that’s not great, but these investments hopefully will increase the tax base in the town,” Mr. Danowski said. Mr. Walter said he liked the site plan Mr. Barra has submitted and doesn’t think it will clear-cut all the trees on the parcel, as several developers have done recently on Route 58. “Kenney Barra does a nice job with landscaping,” Mr. Walter said. “There’s a couple of pretty dense tree buffers proposed in several locations and there’s a natural tree buffer around Sound Avenue and he does a beautiful job of dressing up East Wind Caterers,” which Mr. Barra owns. “When you’re driving along Sound Avenue, you don’t even notice that East Wind is there,” Mr. Walter said. “When he does something, he does it right,” Councilman John Dunleavy said of Mr. Barra. The triangular-shaped property for which the shopping center is proposed had been rented to a beverage store. Knightland LLC received site plan approval from the Riverhead Planning Board on Dec. 15, 2011. Members of the nonprofit Riverhead Neighborhood Preservation Coalition filed a lawsuit challenging that approval the following day. The lawsuit claimed the project didn’t comply with the zoning for the property and that the town failed to consider the cumulative impacts of this project along with other development proposals in the area. State Supreme Court Justice Hector LaSalle dismissed the case in April 2012 on the grounds that the nonprofit and the three residents who joined its lawsuit as individuals all lacked “standing” to bring the action and failed to show how they would be negatively affected by the development. The Town Board declined to include Knightland in the Route 25A planning study it initiated two years ago because of the lawsuit. “Once the Town Board refused to intervene and the Planning Board approved this tourist mall — despite state environmental law and the zoning — and then the litigation process became protracted, this clearing permit became fairly inevitable,” said RNPC president Dominique Mendez. “It’s how the process works and it works especially well for developers. “I certainly hope that Mr. Barra does not tear down these woods without having first attained his financing and securing his tenants, otherwise all the community may be left with is a wide swath of stripped land at the start of the Sound Avenue historic rural corridor,” she said. The Town Board recently made code revisions that require developers to obtain a building permit before a clearing permit can be issued. The changes were made after several town officials came under criticism when a handful of Route 58 developers got the OK to clear-cut land before acquiring building permits. Town planning and building administrator Jeff Murphree said the building permits for Knightland are ready to be issued. Mr. Walter said he anticipates the excavating and building permits will be issued simultaneously. 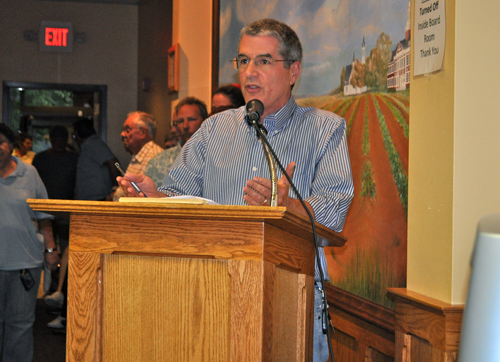 Costco developers to Riverhead ZBA, neighbors: Let’s make a deal! TIM GANNON FILE PHOTO | Excavation at the site of a future Costco on Route 58 stretches up to neighboring homes in Foxwood Village. The attorney for the controversial Shops at Riverhead, which will include a Costco Wholesale on Route 58, made the Riverhead Zoning Board of Appeals an offer Thursday night. It went like this: approve the developers’ request for taller, fewer lights in the shopping center’s parking lot, and they’ll add 10 feet to a planned buffer between the stores and neighboring homes. The developers have already angered residents in the adjacent Foxwood Village and Millbrook mobile home parks by clear-cutting nearly all of the trees from the 41-acre site. Two weeks ago, their attorney, Peter Danowski, came to the ZBA seeking variances from the town’s lighting code that would allow lights in the shopping center that were 25 feet high instead of the permitted 16 feet. The company also sought to install lighting fixtures exceeding illumination levels under a canopy at a gas station at the planned Costco Wholesale store. Mr. Danowski said higher lights would enable them to reduce the number of light poles needed from 165 to 61. He said this would produce the same amount of lights and would be an improvement aesthetically and in terms of safety, because less cars would crash into light poles. Neighbors, meanwhile, have told both the ZBA and the town Planning Board that the current fence dividing the land from neighbors, as well as a proposed vegetative buffer, are not sufficient. Mr. Danowski’s offer did not change anyone’s mind in the audience Thursday, as numerous speakers urged the ZBA to reject the proposal for taller lights. “We really feel you should say no to this application,” said Dominique Mendez of the Riverhead Neighborhood Preservation Coalition . She and other speakers said they believe the applicant’s real motivation for building fewer light poles is simply to save money. Residents also didn’t buy the logic that fewer poles are needed so drivers won’t crash into them. “If people hit the poles, it’s because they can’t drive,” said Millbrook resident Diane Barba. Marylee Feldman presented a petition with more than 200 signatures of residents urging the ZBA to reject Shops at Riverhead’s variance request. Milbrook resident Chris Knopp asked that the developer put a 12- to 14-foot concrete fence up to shield neighbors from the shopping center. He also said that Millbrook residents will likely get flooded in heaving rain storms because they are below the grade of the shopping center. Another Millbrook resident said that since the trees were cleared, they get light and noise from Route 58 coming into their homes. Shops at Riverhead had received approval from the town Planning Board to clear cut the site, agreeing with the developers that this was needed so they would not have to disturb the area twice if they decided to expand the site in the future, and also saying that it enabled them to avoid importing or exporting material from the site. While the trees were cleared right to the Foxwoods property line, Shops at Riverhead plans to build a 30-foot vegetative buffer to shield the homes at Foxwood Village from the development. Mr. Danowski said Thursday that if the ZBA approved the variance on the lighting poles, the developer will build a 40-foot buffer with evergreen trees. The ZBA took no action on the application and adjourned it to the Aug. 22 meeting, which starts at 7 p.m.
BARBARAELLEN KOCH PHOTO | Neighbors have been complaining about noise and ground shaking near Gershow Recycling on Hubbard Avenue. Residents of the Riverhaven manufactured home park on Hubbard Avenue say noise from the adjacent Gershow Recycling business is shaking their homes. An attorney for Gershow said the company is aware of the complaints and is taking steps to address the noise problems. Gershow Recycling, which is based in Medford and has a number of sites on Long Island, bought the former Fred J. Gallo Used Auto Parts site on Hubbard Avenue in 2012 to continue to operate an “end of life vehicle recycling facility,” as Gershow termed it on a state Department of Environmental Conservation application. But nearby residents say there was never any noise when Gallo owned the site, whereas, since Gershow has taken over, they now hear loud booming sounds all the time. In August 2012, the Riverhead Town planning department determined that Gershow’s plan to take over the Gallo site was “de minimus,” meaning it did not require a site plan application or a site plan amendment from the Planning Board. The state DEC required Gershow to get a freshwater wetland permit, build a retaining wall and regrade the site to prevent rainwater runoff from going into Saw Mill Creek. Peter Danowski, a Gershow attorney, said in an interview Tuesday that Gershow has already taken a step toward reducing the noise. The company had been using a crane with metal treads, which made a lot of noise on the concrete ground, and has just spend $367,000 for a new crane with rubber treads, Mr. Danowski said. Greshow also plans to place metal containers along the property line to buffer the noise, Mr. Danowski said. If the containers don’t work, the company will try other solutions until it finds something that does work, he assured. “We start with a couple of containers near a neighbor, and then talk to that neighbor and see if stopped the noise,” Mr. Danowski said. Mr. Dunleavy told the Riverhaven residents that as long as Gershow is following town code, “there’s nothing we can do about this,” other than trying to level with them and have both sides agree to be good neighbors. Recently released campaign finance disclosure filings show that both Mr. Dunleavy and Councilwoman Jodi Giglio received campaign contributions from Gershow’s owners. Mr. Dunleavy said he plans to work with Gershow to resolve the noise problem for residents. Gershow has received complaints about noise and shaking from neighbors of its Medford location as well, according to news reports from over 30 years ago. In the late 1980s, residents near a Gershow facility in Medford said it caused their homes to shake, created noxious fumes and periodically “exploded” with a sound resembling an airplane crash, according to a Newsday article at the time. Gershow later reached an out-of-court settlement with those residents, who had gone to state Supreme Court to stop the operation.